Our range of products include bio coal briquetting press, bio coal briquetting plant and white coal briquetting plant. Radhe Group Rajkot is engaged in providing the Bio Coal Briquetting Press. 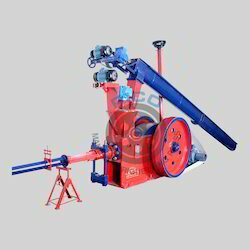 You can maximum utilizing your raw materials in our bio coal briquette press. It provides high quality bio coal briquettes without using any binding chemicals. The Bio Coal Briquetting Plant is broadly used as it produces the more economically feasible and affordable bio fuel briquettes with fewer efforts. So, the finished products briquettes from the bio coal briquetting plant are the nature friendly solid fuel that can be easily accessible to all. We are engaged in offering excellent quality White Coal Briquetting Plant to our valuable clients. White Coal Briquetting is the densification of loose biomass material to produce compact solid composites of different sizes with the application of pressure.